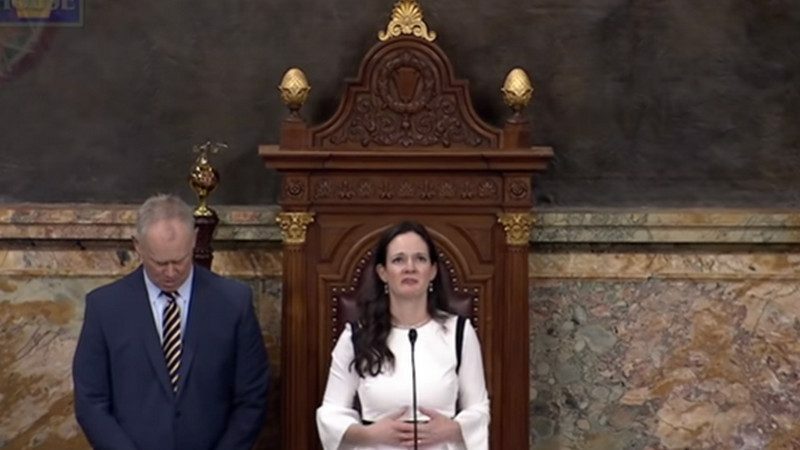 PA State Rep. Stephanie Borowicz prays to open the House session on March 25, 2019. Conservative Christians are rallying around Pennsylvania State Rep. Stephanie Borowicz, who has been widely criticized for the sectarian, political, triumphalist prayer she offered last Monday to start a session in which the first Muslim woman elected to the state House was to be sworn in. Guidelines for legislative prayers in the Pennsylvania House have in the past asked guest chaplains to keep their prayers nonpolitical and respectful of all faiths. Many legislative prayers ask God to give lawmakers wisdom while carrying out the people’s business. An atheist has even offered prayers in the state Senate, but House Speaker Mike Turzai is appealing a court ruling that he allow non-theists to serve as guest chaplains. Meanwhile, representatives are offering opening prayers. That prayer, which also offered thanks that President Trump “stands beside Israel unequivocally,” was particularly provocative, coming as it did just before the swearing-in of Movita Johnson-Harrell, a Muslim woman who recently won a special election. House Democratic Whip Jordan Harris was among the critics, saying that Borowicz had “weaponized” prayer. American Pastors Network’s Sam Rohrer had Borowicz on his “Stand in the Gap” program on Thursday as part of a segment on “American Exceptionalism.” She said the prayer reflected her passions: “Jesus, our nation, our freedoms, our liberties, because those come through Jesus.” Asked why she thought the prayer had caused such controversy, she said, “You know, I think that there’s power, Sam, in the name of Jesus, and it’s been a while maybe since somebody stood up and prayed in the authority and power of Jesus’s name.” Rohrer’s colleague Gary Dull, executive director of the Pennsylvania Pastors Network, was among the Borowicz supporters who suggested that objections to the prayer were raised simply because it was Christian. Franklin Graham also posted a defense of Borowicz, writing “God bless her for her boldness,” and, “I always appreciate anyone who has the guts to stand up for Jesus.” She cited Graham’s support while on both Starnes’ and Rohrer’s shows. “I stand for Jesus no matter what and no matter who I’m in front of,” whether she’s in front of her church or somewhere else, she said. Elected officials or even clergy who are given the privilege of offering an invocation at a secular public event no longer have the privilege of assuming their audience shares their faith tradition, or any faith tradition. Muslims, Hindus, Buddhists, and practitioners of Native American or new-age spiritual rites are likely to be seated among the atheists, agnostics, Orthodox Jews, secular Jews, and Catholics who share the rows with evangelical and mainline Christians of many descriptions. Borowicz probably didn’t intend it, but her over-the-top performance underscored the risk of enshrining religious expression at ceremonial occasions, and especially in public settings that are inherently political. Her mixing of allusions to Jesus with references to President Trump, surely among the least pious politicians imaginable, gave her invocation an unwelcome partisan cast. Solemn public occasions deserve better, particularly those financed by the taxpayers. A prayer is inherently a form of religious expression, so a moment of silence, rather than “silent prayer” or “moment of reflection,” to name two popular variables, would create space for believers and nonbelievers alike to participate in the camaraderie and community such occasions promise. Rethinking this custom in no way requires anyone to compromise spiritual beliefs. Rather, it’s an opportunity to avoid disrespecting religion — and politics, too, for that matter — by confusing a house of government with a house of worship.